Birmingham Watch buyers. 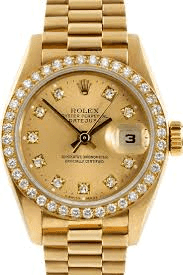 If you want to sell a secondhand watch in Birmingham, Rolex Omega IWC vintage watch or a gold, silver, or stainless steel; automatic or wind-up tel 0121 448 0488. Many watch buyers jewellers etc only give a small fraction of your watches true value! We pay great prices as we only work on a small percentage, ultimately we buy and sell more watches due to the highest prices paid for second-hand & used watches. Rolex, Omega IWC & Cartier urgently wanted, but also we buy Seiko, Tag & of course Breitling. We are looking for gold watches, silver watches & stainless steel, quartz, automatic and wind-up watches. We pay a great price as we only work on a small percentage, ultimately we buy and sell more watches due to The highest prices paid for second-hand & used watches. If you can't travel to us then post your watch special delivery for an immediate sales appraisal and offer to : The Birmingham Watch Company (Part of The Birmingham Gold Company)94 Vyse St Birmingham B18 6JZ. NB Tempted to sell your watch to that online fancy watch-buying website? These days many online watch buyers make very high offeres to encourage you to post your watch to them. Once it is in their hands they weill lowball its quality, condition etc so that you end up with a much lower offer. We DO NOT undertake this dubious practice. We buy Second-hand and vintage watches For Fantastic Prices! Customers don't just come to us to sell gold! As long-established gold buyers and silver buyers we also also buy watches, diamonds, platinum & silver. NB We urgently require all makes of Pocket Watches as well as wristwatches including Waltham, Elgin, Rolex, Omega, IWC, Cartier and other well known watches in gold and steel. best prices paid, Give us a call to discuss. 0121 448 0488 or visit our watch site here . When you want to sell a watch in Birmingham, eg Rolex or Omega then call in to see us. We also accept watches by post. please telephone first. We are particularly looking for all gold pocket watches at the moment, regardless of age and condition working or not . When you want to sell your diamond you want the best price and the minimum of fuss. The price we pay you for your diamond will depend on the 4 C's ie Colour Clarity Cut Carat In a Diamond, the degree of yellowness represents its color. The number of flaws and extent refers to its clarity. Carat weight represents its weight in carats. Call in to see us in Birmingham for an appraisal or post your diamond to use using Royal Mail's excellent Special Delivery Service which is fully trackable and insured. if you do post your items to us we will contact you asap with an offer. In the unlikely event that you decide not to sell, we will return your item to you, special delivery without charge.